Big Data is a big term that’s having a moment right now. But while everyone is getting more and more eager to embrace the wonders of lots and lots of information, businesses should be aware that getting ready for Big Data is about more than just preparing for an onslaught of terabytes. What’s actually going to be the most distinctive part of this trend will be not the size but rather the sources of data. Businesses, take note: gaining a competitive edge will be about understanding and utilizing a multitude of new data sources to glean novel insights. So first things first, let’s unpack that loaded term: what does Big Data actually mean? If you’ll look it up on Google, you’ll get the definition of “extremely large data sets that may be analyzed computationally to reveal patterns, trends and associations.” Whew. That’s a bit more in line with the field of business analysis or intelligence. Businesses thrive on the ability to acquire insights from data. Using all available information they are able to make smarter, fact-based, faster and usually better decisions. As recorded information grows and grows (check out How Much Data Will You Have in 3 Years), storing, handling, and processing data starts becoming complicated due to its size and veracity. However the question of when data becomes too big to handle is completely relative, and each company has its own Big Data parameters. In fact, whereas the myth goes that Big Data means lots and lots of data, actually 95% of companies only use between 0.5 to 40 terabytes of data (source). Preparing your business to start using all the data that it’s collecting is a pretty individual process because the only thing you’ll know for certain is you’re going to have much more of it. The key is to figure out, not just how much you’re going to have, but rather where it’s all going to be coming from and how you’re going to bring it all together. Most modern businesses already have a variety of sources collecting data, from on-premise systems like ERP or CRM and helpdesks to cloud services such as Salesforce, Google Analytics and Adwords, etc. A lot of information is also stored in continuously updated and increasingly larger Excel spreadsheets. All this information is going to be expanded with the introduction of new forms of data that are also becoming common- most that just a short while ago wouldn’t have been considered relevant to business analysis. These include things like machine data, which through providers such as Splunk, creates records of machine performance. Many new types of data, such as that from sensors and trackers, will also suddenly become available with the rise of the Internet of Things. Importantly, most of this data might be meaningless on its own, but very relevant when put together with other sources. Some of these other sources are also going to be coming from new places that might not have been exploited before. 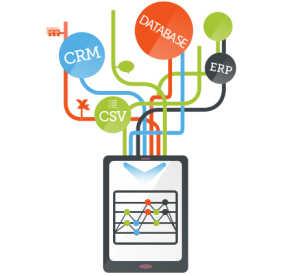 External data sources could start representing a significant aspect of any business’s analysis. Though businesses today are aware of the many free external sources out there, they might not know how to actually leverage this data. The types of information that is useful to many companies is anything from weather data to government data, or social media. And it can be utilized well, to deepen the understanding of markets, audiences, buying trends, and more. Fortunately technology is catching up with this need, and today there are business intelligence tools that businesses can use to combine all these different data sources – no matter how many or how big they are. Large enterprises have been at this for years, but now anyone can now afford robust analytic tools. While these tools can totally transform the way a company does analytics, it’s important to watch out for software that is accessible to business users. Good tools will make it easy for non-technical users to combine numerous, large data sources (whether external or in-house) and build insightful dashboards and reports. Giving everyone in a company the chance to dig into all this new data is a great way to foster creativity and insightfulness, and is the real way to take advantage of current data trends. Remember that the key to gaining a strategic advantage today is by determining where opportunities exist while looking at all existing data. This means you’ll need to approach analysis in a new way, a way that brings everything together so you can see the Big Data big picture. Because, as we said, it’s not about lots of data, but rather lots of sources.